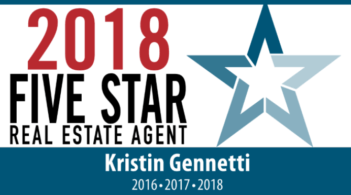 Through pure luck Kristin Gennetti became my real estate agent. She worked as my selling agent on my existing home and also worked with me as purchasing agent when we bought our new home. With Kristin’s hard work and exceptional knowledge she set up our open house within two days. That said she was also working on our new home at the same time and this was also finalized within the same time frame. With Kristin, my best interest was always a priority. She called me almost everyday and kept me up to date on everything I had to do and when it should be done. She also kept me in check so that I received exactly what I was entitled to. With Kristin’s guidance, my home sold for a very good price and she worked to get me a very good price on my new home. Selling a home can be very stressful but with Kristin it was a wonderful experience. I would recommend her to anyone buying or selling a home. I always believe you get what you pay for and Kristin is the best! !